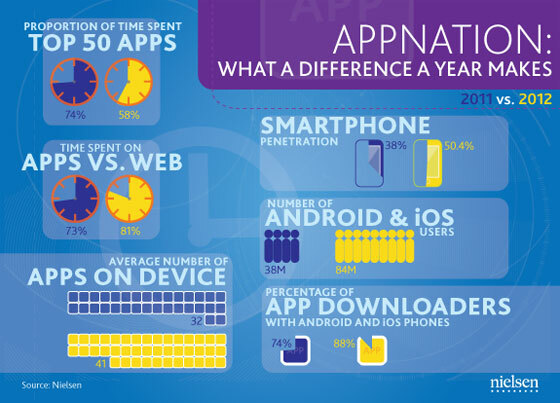 The average time spent on new apps is nearly as high as last year, 39 minutes. That’s up two minutes compared to 2011. Though more time is spent in apps, the increase is not as much as the increase of apps downloaded by consumers. In other words, consumers are likely to spend less time per app meaning apps are less engaging than last year. The top 5 apps haven’t seen any change at all. It is still Facebook, YouTube, Android Market/Google Play, Google Search and Gmail. Mobile security remains an issue for many consumers. A growing concern even as 73% (up from 70%) is concerned about sharing personal data. 55% is feeling insecure about sharing their location through an app. Smartphone penetration went up from 40% in 2011 to 50% in 2012. The number of Android and iOS users together has doubles, pointing out that less consumers are interested in OS’ like Bada, Symbian and Windows Mobile. Share Nielsen: Consumers Download More Apps than Ever! This entry was posted on Sunday, May 20th, 2012 at 7:07 pm	and is filed under Analysis & Editorial. You can follow any responses to this entry through the RSS 2.0 feed. You can leave a response, or trackback from your own site.